Not long ago a friend and I ordered a couple of Peroni beers in an Italian restaurant. The bottles that turned up moments later bore no relation to the usual Peroni Nastro Azzurro (blue ribbon) bottles that we expected. True it said ‘Peroni’ on the label, but the typography was all wrong, there was too much noisy red in the design and, even worse, there was a picture of a football team – a total turn-off for two life-long Big Match avoiders. I realised later that this must have been the lager sold under the name Peroni in Italy, where the distinction between Peroni and Peroni Nastro Azzurro is more significant. My friend was clearly unsettled by this semiotic setback. ‘How do we know it’s the real thing?’ he complained. All I could do was point to Peroni’s address on the bottle. It only goes to show what the high priests of branding never tire of telling us. Brands are – at least partly – about trust. In an uncertain world, where quality is liable to vary, we rely on familiar brands to deliver exactly the same experience that they provided on the previous occasion. While neither of us, especially my friend, likes to think of himself as the kind of person who cares about such things, this little incident was a reminder that brands condition our expectations and even determine our pleasure, whether we realise this is happening or not. You can’t taste the label yet its aesthetic signature still establishes a vital context for the drink. 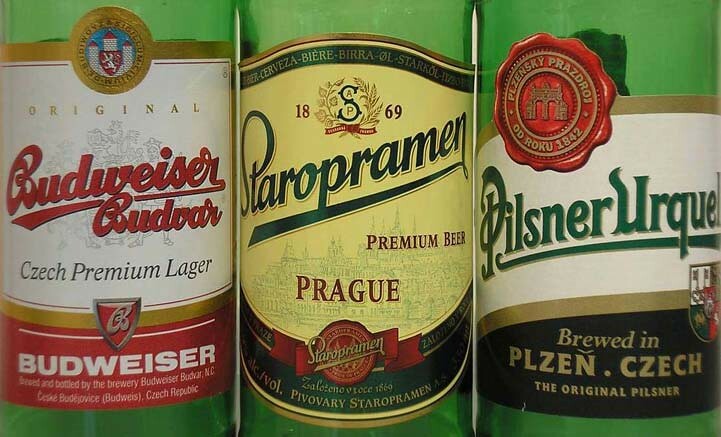 The two other Czech beers best known to British buyers, Pilsner Urquell and the less common Staropramen, are equally, if not more, elegant in their label designs. All three employ the same essential elements. The name is set on the slant with a thin drop shadow to lift it and the style – Staropramen is also rendered in script – evokes an illustrious heritage stretching back a century or more (Pilsner Urquell from Plzen, the first of the ‘golden beers’, dates from 1842; Staropramen, brewed in Prague, from 1869). All three names begin with a curvy, energetic flourish and sit comfortably on a long, emphatic stroke angled at one end; in Budvar and Staropramen this shoots out from the final letter. Simulated red wax seals – Staropramen also throws in a ribbon motif – act as official-looking certificates of excellence. Each beer refers to its place of origin with heraldic devices or a crest. Behind the word ‘Prague’ on the pale yellow Staropramen label there is a view of Prague castle and the Charles bridge. Although the beers come from different brewers, seen together they seem to express the spirit of a larger brand entity: the country itself. The reality of beer ownership is more complex than these heartening symbols of local reliability might suggest. I had been drinking Pilsner Urquell for some time before I found out that the brand now belongs to SABMiller, one of the world’s biggest brewers, which owns Peroni as well as many other beers. Staropramen may look about as ‘local’ as a premium beer can be – they love it in Prague, where it’s available in more than 800 pubs and restaurants – but since 2000 it has been owned by InBev, the world’s largest brewer by volume, which also sells the likes of Stella Artois and Beck’s. (The Staropramen label was redesigned for the Czech market earlier this year.) I know I should support Budvar, which remains in Czech hands. The trouble is I prefer Pilsner Urquell. It’s still brewed only in Plzen and connoisseurs rate it one of the best beers. Nice label, too. Damn.